A few months back, we stepped inside a beautifully eclectic home belonging to a very stylish lady who goes by the name of Guida. Effortlessly blending vintage and design in her home with very charming results, she strikes the balance between old and new, throwing in a bit of kitsch without compromising her sleek sense of style. When I was shooting her home, I couldn’t help but admire a gallery of eclectic artworks adorning one of her walls, but knew that pulling off that much vintage in one collection is no easy feat. 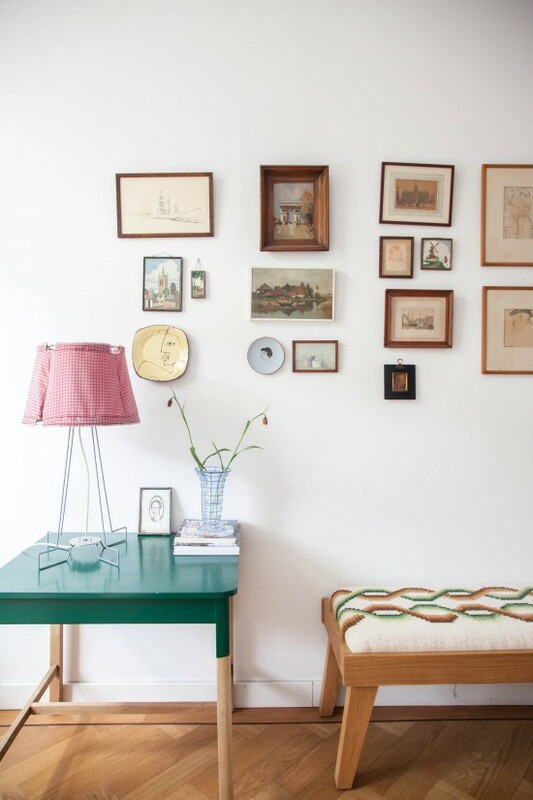 I have seen some vintage galleries that look downright kitsch but Guida gets it so right with hers that I thought I’d share with you some tips on achieving this look in your own home and show you why and how this works so well. Guida’s gallery is granny but clean, eclectic but calm. There are quirky as well as sophisticated pieces in there but on the whole it doesn’t take itself too seriously, which is why it looks so effortlessly composed and altogether whimsical. So why does this gallery work, and how can you create the same effect at home? The framing of art is every bit as important as the art itself. If the frames are off, the whole gallery is off, and this gallery could have gone very wrong had the framing been different. Like mismatched chairs around a table, the key to mismatched frames and art working is keeping a certain degree of consistency, a red thread that ties the collection together, and in this case it’s through the material and colour of the frames that this collection comes together. 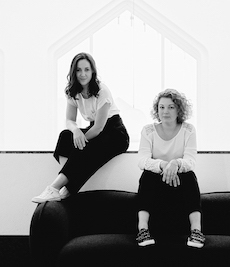 Many types of frames have been used but they all have a common denominator – they are primarily made from wood, all but ONE white metal frame and two round ceramic pieces which balances it all out and stops it looking too heavy. Varying shades of wood in various thicknesses come into play making it all very playful, but the overarching look and feel is calm due to this consistency. This gallery is all about the playful selection of artworks and the artful way they have been placed on the wall. 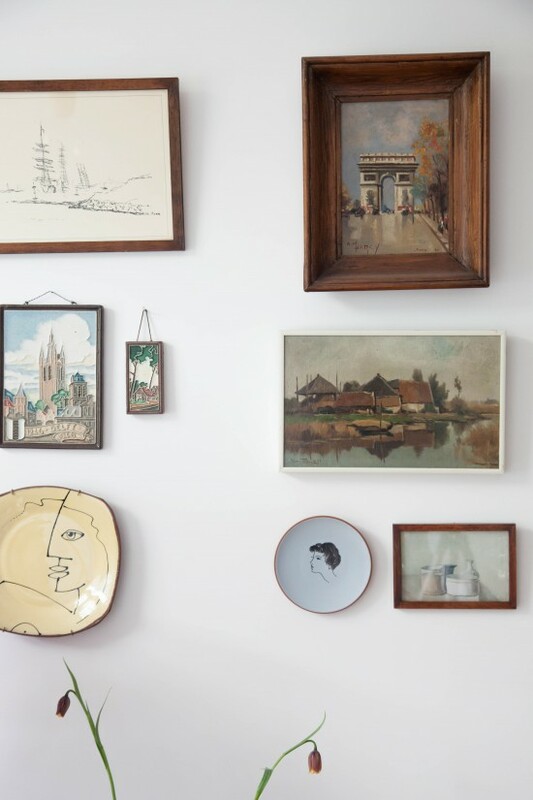 Mixing in a couple of round ceramics on the wall, as well as including some pieces with different picture wires, helps to break up the composition and keeps the gallery wall interesting. It looks eclectic and playful at first glance with all the different shapes, sizes and art styles, but there is a theme in this collection of art. All of these pieces are vintage paintings or etchings. Some with more colour, others mere sketches but the story here is history, and every piece plays a part of a whole historic story on the wall. Different sized artworks from very small to larger pieces that ground the collection and stops it from being ‘bitsy’. 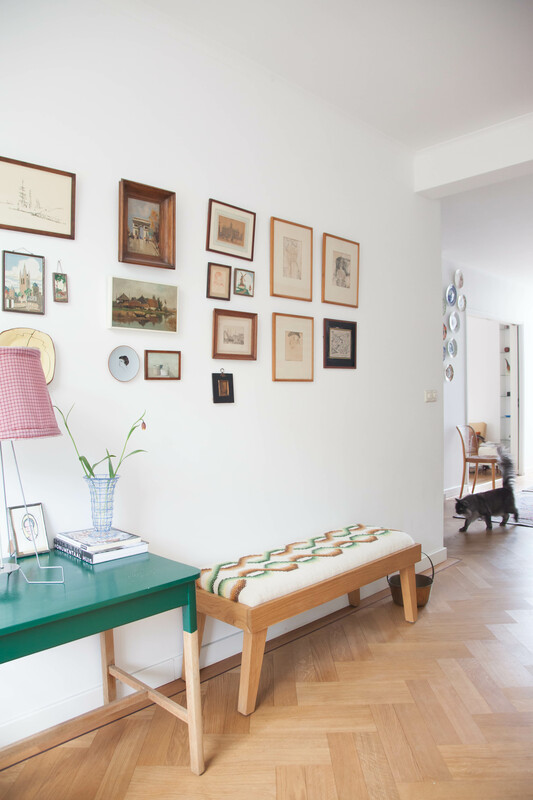 We talked about keeping a degree of consistency when arranging a vintage art gallery – from framing to the art itself – and thinking about the lines in the arrangement helps in this sense too. Look for existing lines in your home, such as the upper edge of a door, a window frame or mantelpiece, to use as the basis of your gallery. 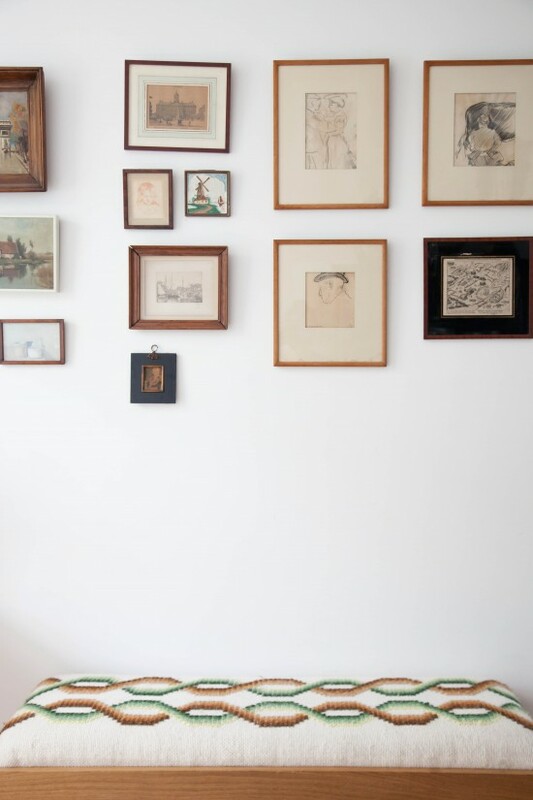 Also think about spacing, and keep some consistency, but don’t be afraid to leave a larger space between some frames, as this can contribute to an airy but whimsical look. An eclectic gallery needs clean lines to look balanced, and you’ll notice that this gallery shares the same upper line, while the right side of the gallery falls in the same line as the end of the bench, keeping it balanced but retaining its quirky first impression. An eclectic array of vintage artworks can still look calm and serene, which in this case can be attributed to the neutral palette Guida stuck to when composing her gallery. The majority of artworks stick to a neutral palette (black, cream, blush and white), while a few pop out of the bunch with faded greens, blues and browns. These hues work so well with the bench below the collection with its textures upper in greens, creams and browns, that it all just makes sense. 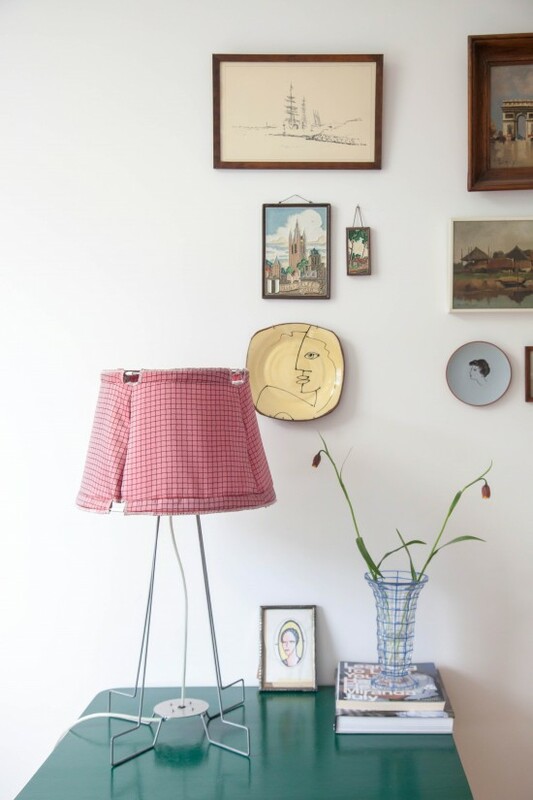 The pop of watermelon pink from that fun lampshade is enough to add just the right amount of whimsy to the lot but not enough to go overboard. It’s colourful, but not overwhelming, thanks to the primarily neutral base and consistent palette throughout the artworks. Crisp white walls provide a clean, blank canvas for this eclectic collection while a couple of vibrant jolts of colour add interest to the composition. Artworks tell a lot about their owners. When selecting pieces for a gallery wall, try to create a narrative on the wall that reflects you and your own story. This will likely be an organic process, because you will be drawn to pieces that trigger an emotional response that is only relevant to you, so inherently your art all tell your story over time and be something that conjures up sweet memories for you. This collection tells a wonderful narrative of it’s owner, a Portuguese woman living in historical Delft, The Netherlands. She has always had a penchant for vintage and Delft has a fabulous antiques and curiosa market each Saturday during the summer. This is where she has gathered many of these whimsical works of art, many of which are pictures of characteristic buildings in Delft, windmills and Dutch landscapes interspersed with vintage etchings and sketches. There’s a visual narrative telling us about where she lives, where she came from and where she finds meaning. It’s all very beautiful if you look closely. So guys, are you ready to hit the markets and secondhand shops? I have found some of my most treasures artworks at overflowing market stalls in stifling summer heat, shuffling along to get a closer look and that feeling of anxiety in the pit of my belly at the thought of someone else reaching for it first. It’s a treasure hunt and so fun when you come home with another piece to add to a growing collection! But vintage pieces can also be found online, such as Etsy, eBay and Marktplaats and I have bought some gems online in the past. Whether or not eclectic galleries are your thing, I do advise you to make a plan before getting out the hammer and nails. I do this by laying everything on the floor and arranging them starting with the largest painting and shuffling them around until the balance feels right, keeping spacing relatively even around artworks. Then using butcher’s paper, I trace around each artwork, cut them out and arrange them on the wall with tape. I’ve been working on a gallery of my own at home, here’s a peek at how it looks. I can’t wait to share the results with you soon, but I have some tweaking to do before I’m satisfied with it. This post has inspired me to get cracking! What about you guys? Do you have a collection of art and how are they arranged? I’d love to know. Thank you for the wonderful tips on creating an eclectic gallery wall! Can’t wait to get started on my own wall!